Silent Melody, first published in 1997, is a sequel to Heartless. It is the story of Lady Emily Marlowe, the young sister of Anna, and of Lord Ashley Kendrick, younger brother of Luke, Duke of Harndon. 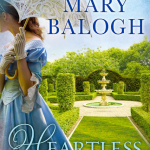 At the end of Heartless, Ashley was on his way to work in India and Emily was left brokenhearted. But now, seven years later, Ashley is suddenly back in England, having come quite unexpectedly. Emily’s heart had been broken all over again a few years before when word came that he had married and had a son. Now, however, she is about to be betrothed to Lord Powell and tries to resist her renewed and forbidden attraction to Ashley, who claims that he left his wife and son in London while he came to Bowden Abbey, where Emily lives with Anna and Luke. This was a difficult, challenging book to write, for Emily is a deaf mute, and in the eighteenth century there was no way of communicating with the deaf. They were usually considered insane and confined to insane asylums. Emily is fortunate to have had a loving family to keep her and care for her, and she has always had a special connection to Ashley, who understands her facial expressions and gestures and has even created a sort of language with her. But Emily is not a victim. She is not handicapped. She lives a rich life within the silence of her world, and as a new relationship develops between her and a deeply troubled Ashley, she has as much to teach him about her world as he has to teach her about his. The difficult part of writing their love story was that the dialogue was necessarily limited—and I love writing dialogue! 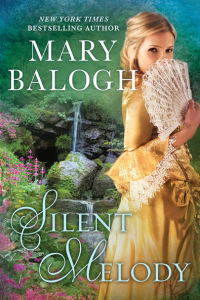 Silent Melody has always been a reader favorite—and it has won the approval of a number of deaf people and of people closely related to a deaf person. I have been told that I got Emily right! I hope new readers will agree. Ashley has come home unexpectedly from India and arrives at Bowden Abbey in the middle of a ball at which Emily’s betrothal to Lord Powell is to be announced. Exhausted as he is, Ashley insists upon dressing for the ball, and he insists upon dancing with the loveliest lady—who is Emily. She cannot dance because she is totally deaf, but Ashley will not take no for an answer. “‘Tis madness, by my life,” Luke gave as his opinion as he sat in his brother’s dressing room, one leg crossed elegantly over the other, his eyes watching the powder in a cloud above Ashley’s head, then lowering to watch the valet gingerly remove the powdering gown Ashley had donned over a full-skirted evening coat of burgundy brocade. Ashley laughed as he stood and buckled his dress sword at his side and slipped his stockinged feet into heeled and buckled shoes. He was feeling rather wild and reckless. What was the point in going to bed, as his mother and Luke and Anna had urged him to do? He would not sleep anyway. He rarely slept. But the absence of sleep was worse when one lay alone in a darkened room. No, he would go down to the ballroom and dance. Luke pursed his lips and looked keenly at him. “There are,” he said. His tiredness was forgotten. Suddenly he was filled with energy. Suddenly he wanted to dance all night and all tomorrow too. He wanted noise and laughter and movement and flirtation. Above all, flirtation. He was standing inside the doorway of the ballroom again a few minutes later, his brother at his side. A vigorous country dance was in progress. He resented the fact that he would have to wait for it to finish before he could dance himself. He felt drunk with exuberance and gaiety. He looked about him with interest. He saw the members of his own family, who looked surprised to see him all decked out for the ball, and then smiled at him. He saw a few familiar faces from the neighborhood. He saw Agnes, Anna’s younger sister, who was dancing. She was Lady Severidge now, he remembered, of Wycherly Park, close by. She had grown plump. Then his eyes lit on a young lady who was sitting on a sofa some distance away, half turned away, though he had the impression that she had looked away from him the very moment his eyes moved in her direction. He smiled. He had noticed the same thing with a number of other people in the room. Doubtless he was the sensation of the hour. Luke did not answer, and Ashley swung his eyes to him and laughed. Ashley did not hear what would be better. Emily. Emily. Emmy? He stared at her blankly. She was totally unrecognizable. Though that was not the real reason he stared. She was the one person he had not thought about during his journey home. He had not really thought about her in years. And yet now he remembered all in a rush how very…precious she had once been to him. He had carried her in his heart for many long months after his departure, half with pleasure, half with heaviness, until the heaviness had outweighed the pleasure. He had missed her. He had wanted her. Not sexually—she was a child. Nevertheless he had needed her—her companionship, her acceptance, her devotion, her happiness, her peace. But he had despised his need for a child. He had been uneasy with some guilt over it. He could no longer remember quite why he had felt guilty. He had put her very effectively from his mind. And then he had met and fallen in love with Alice. And had married her when he had found his feelings returned. It had been love based on need—perhaps on both sides—just as his love for Emmy had been. But with Alice it had been reassuringly sexual in nature. She had been a woman and not a child. His lips tightened with memory for a moment. But by God, how could he have all but forgotten Emmy? And not even given her a thought during the voyage home? And not thought of seeing her in Luke’s ballroom? It was as if he had pushed her ruthlessly from his consciousness and slammed the door on her. He no longer remembered why he would have done so. “Take me to her,” he said even as he watched another man step up to her and take her hand in his. William Webb, Lord Severidge got to his feet. He did not even notice his brother’s reluctance. Or if he did, he did not care about it. He had come here to dance. To dance with the prettiest lady in the room. And she was the prettiest, by Jove. Emmy. He would dance with her. He had forgotten her deafness. She seemed to know he was coming. She stood and turned to watch him come. But Emmy, he remembered with a jolt of recognition, had always seemed to possess that extra sense. She had always seemed to know when he was approaching from behind her. Even though she could not hear. Ah, yes, there was that. He recalled it with a shock of memory. Emmy could not hear. Or speak. Or communicate except with her eyes and certain gestures he had grown adept at interpreting. And had they not devised something resembling a language between the two of them? Zounds but he had forgotten so much. She was Emmy right enough. Emmy masquerading as a grand lady and doing magnificently at it. But Emmy all the same. There were the eyes, large and expressive, leaving one with the impression that one could look through them straight into her soul. But she was a woman. He felt strangely sad. “Emmy.” He took her hand from her side. It was limp and icy cold. He smiled. “Hello, little fawn.” He had forgotten his old name for her until he heard it coming from his own lips. And how inappropriate it seemed now. She was an elegant, fashionable, beautiful woman. Again he felt that flashing of sadness. The name had used to fit so well. Her mouth quirked into the most fleeting of smiles. But she was pale and serious. He brought her hand to his lips. She stared mutely at him and there was nothing in her eyes that he would instinctively have recognized. Ah. She was not glad. Seven years had passed. He wished unreasonably that she of all people and places and things could have remained the same—a wild and lovely and happy child. What a selfish thought! Ashley made his bow, as did Lord Powell, briskly, the annoyance unconcealed on his face. So this was to be Emmy’s husband? And he was already possessive of her? Even jealous, perhaps? Ashley turned back to Emily with a grin. Her eyes had taken on depth and he realized with some satisfaction that he could still read them, just as if seven years had not passed since he had last looked into them. Yes, of course she longed to dance. She always had. He knew it as surely as if she had put her feelings into words. Had no one else this evening seen the longing there? The longing to dance to the silent melody she could hear in her heart? And he was drunk with longing himself. For several moments she merely stared. Her nod, when it came, was almost imperceptible. But they all saw it. “Emily,” Luke said, but she was looking at Ashley, not at him. “Ash—” But Ashley took no notice of him. He was still smiling at Emily, a look of triumph and recklessness in his eyes. Lord Powell bowed. “I shall return to take Lady Emily in to supper,” he said. She walked beside him to take their places in a set. Emily had not grown taller since the age of fifteen, he noticed. She had been slightly above the average in height then, and slim and agile as a young colt. She had developed womanly curves since then, accentuated by the fact that she wore stays and hoops. But she had not really changed in any other way. Not physically, anyway. He wondered if they really had tamed her during the seven years of his absence. If they had imposed all the trappings of civilization upon her. He hoped not. By God, he hoped not. She looked up at him and he smiled at her as the orchestra began to play. Ah, yes. And her face was no longer that of a pretty child, but that of a lovely young woman. He knew he had just done a dastardly thing. He had taken her from the man who was apparently to propose to her and announce his betrothal to her tonight. He had interrupted the set the man had reserved with her. He had stolen her away with the temptation of fulfilling a dream he knew very well she must always have had. Emmy would always have wanted to dance; anyone who had ever known her must surely understand that, he reasoned. He had not known her for seven years, but he remembered her as a child who was born to dance. He was drunk with emotion. He did not pause to analyze the strange thought. He had done a dastardly thing. Another heavy burden to add to a dauntingly long list. But he did not care the snap of two fingers. Tonight he had arrived home. Tonight he was going to enjoy himself. Tonight he wanted to dance with Emmy. And Emmy wanted to dance. And dance they would, by God. Together. It was only later that she realized what she had done, how very unmannerly she had been. She was remorseful then, for herself and the selfish weakness she had portrayed and for Lord Powell, whom she must have humiliated. But it was only later that she felt those things. She had been caught up in some magical spell, and reality did not exist for her. He was there before her, speaking with her, holding her cold, cold hand in his strong warm one, smiling at her, calling her his little fawn as he had used to do, just as if seven years had rolled back and they were as they had used to be. He was here again, and real flesh and blood. He was the same and different. His eyes were the same, his blue eyes that searched desperately for meaning, for peace. His smile was the same—boyish, mischievous, reckless. His restless energy was the same. He was the Ashley she had known and adored. But he was different. Peace had forsaken him, and with it…hope? Was it despair that impelled him forward now? It looked very like despair to her searching eyes. And he was no longer a boy to whom restlessness and eagerness were appropriate. He was a man, hard and harsh beneath the surface gaiety. He was thin, haggard. Not with the paleness of one who has traveled long and far, but with the paleness of one who has suffered almost more than he can bear. He looked liked a man who was close to breaking and who might yet break. Yet he was there before her. He had come home. And he needed her to dance with him. Not only wanted it, but needed it. She sensed his need like a tangible thing. Even such a small thing as her refusal might snap him in two. But despite that realization there was magic. Irresistible, wonderful magic. He was asking here to dance. He did not doubt for a moment that she could dance. And he knew instinctively that she wished to dance, that she had always wanted to dance. She had almost forgotten how well Ashley had always understood her. Perhaps it was one reason she had loved him so dearly. He had seemed so nearly the other half of herself. He was asking her to dance. How could she possibly resist? How could she possibly say no? The temptation was just too powerful. Though at the time she did not even think of it as temptation. If she had, perhaps she would also have paused to realize that there was something wrong about accepting. But she did not realize it—until later. And so she danced. A minuet. With Ashley. It was not as easy as she had expected. Now that she was moving herself, she was not at liberty to watch as she always could when she sat at the edge of the floor, sometimes with her eyes half closed, seeing the rhythm and patterns of the dance as an ordered, visual kaleidoscope. Feeling them in the pulsing of her blood. Although she knew the steps, now that she was part of the kaleidoscope, she was not quite sure of the timing. But Ashley grinned encouragement at her and the magic caught at her again. She closed her eyes for several moments, not even trying to watch the other dancers, merely feeling the vibrations of their feet on the floor and of the instruments playing the tune. And then it was almost easy. She could feel the rhythm pulsing in her body. She moved her feet in time to the pulse, using the remembered steps and patterns of the minuet. As if she had stepped into a painting and had become part of the perfect symmetry of its composition. It was, she thought, the most glorious moment of her life. She was dancing. With Ashley. And then she was smiling at him, feeling all her happiness flowing out to him, feeling all the joy of the music she had never consciously heard and never would hear. She saw his words. In addition she could see the harshness and bitterness in his face. Ashley’s face, also in disguise. Like a grotesque mask that needed to be peeled away. It was then that Emily too saw Lord Powell approach and that the magic was broken. She realized what she had done. She turned to smile uncertainly at her suitor.